An Iceland road trip seems to be on everyone’s list these days. Putting the road trip together though is an adventure on its own, as Iceland offers countless things to see and do, making one feel overwhelmed about it quite easily. During the last three years, we spent close to two months in Iceland over multiple trips. And no, we haven’t visited all of Iceland, but we’re working on that! We must confess, Iceland ranks easily among our all-time favorite destinations. With the experience acquired in the land of ice and fire, we decided to put together the ultimate guide for an Iceland road trip, including all you need to successfully plan your own! If you’re looking into itineraries, when to go, trip duration, must-see sights, useful tips, and juicy extras, look no further, you are in the right place. Let’s look at what you need in order to start planning today your Iceland road trip. Trip duration is crucial to determine how ambitious you can be for your trip. Anything is possible, really. Iceland has plenty to offer for any trip duration. 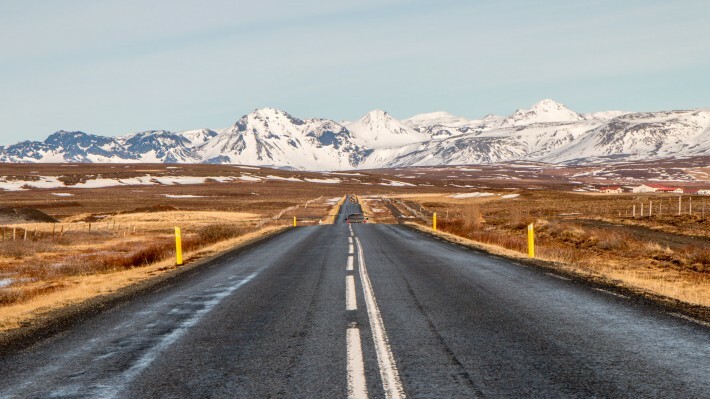 For this guide, we’re focusing on helping to prepare for the essential Iceland road trip itinerary, which involves going around the country, mostly using the famous ring road or road no 1, and seeing many of the impressive natural features. This means that something in the range of at least 8 to 12 days is recommended to tackle this itinerary. Many more days for the extras we have besides the essentials. If you don’t have the time required for this, don’t give up on Iceland just yet. You can visit for a shorter time and still have a blast. For this, stick to one or two regions of the country. We’ll write about shorter trips to Iceland in a future article. Choosing when to go is very important and greatly affects the duration needed for your trip. Two important things to bear in mind are the number of daylight hours and the weather. The high-season in Iceland starts from mid-June and peaks in July until the end of August, when it slows down. The weather is notoriously unpredictable, but the Summer months bring the best of it and also a lot of daylight hours, almost 24h in fact – which is perfect for long days of exploration and the midnight sun. The interior of Iceland, known as the Highlands, also has its roads open. The prices are higher, sometimes dramatically, and most of the scarce accommodation sell out well in advance. May and September are usually great months to visit. On the contrary, Winter months have fewer daylight hours and rougher weather, leading to road closures and a need for a plan B in case the main itinerary cannot go ahead. During this time, the cold and dark bring the possibility of seeing the northern lights. The prices are lower and most of the places even quieter. Early or late winter, such as October and March are also very suitable for a visit. Be sure that Iceland is a great place to visit both Summer and Winter, it’s just a whole different experience. The essential Iceland road trip is around 12 days and we’ve prepared a detailed itinerary to make your trip a success. This itinerary includes day-by-day information about sights to see, things to do, where to sleep and lots of tips. This itinerary of 12 days can be shortened or extended. Read below for more on how to achieve this. 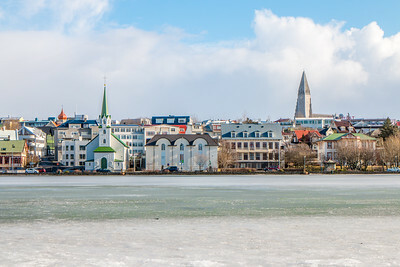 The capital Reykjavík is usually the first stop on any trip to Iceland. The area around it is where the majority of the Icelandic population lives and offers a vast range of amenities and things to do, from museums to restaurants and shopping. Reykjavík is the ideal place to stock up for your Iceland road trip. Central Reykjavík is very small and ideal for walking. The two major highlights are Hallgrimskirkja, an impressive church that offers excellent views from the top of its 73 m high tower, and Harpa, the modern concert hall just by the sea. Don’t forget to visit Harpa at night to see the color of the façade changing. The main shopping area is at the most famous street, Laugavegur, where many restaurants are located. Lake Tjörnin, just next to the city hall, is a very pleasant area to visit and the ideal place to relax on a bench while enjoying the views of the city across it. In terms of museums, the National Museum of Iceland (Þjóðminjasafnið) is where you can find all about the history of the country. Worth a visit. Also worth going are the Saga Museum and 871±2, the settlement exhibition. Recently opened, Whales of Iceland is also a great exhibition to see, as it showcases full-scale whale replicas! A bit further afield from the city center are Perlan and Grotta. The first is a futurist building offering spectacular views of Reykjavík and the surroundings, whilst Grotta is a lighthouse on a tiny island where many birds can be found. To fully enjoy Reykjavík, don’t forget to walk its streets, including at the seafront. Find out more about Reyjkávik and how it serves as the perfect introduction to Iceland. Without a doubt the most popular day in Iceland. In just a few hours, the Golden Circle route allows you to visit at least 3 places: Þingvellir, Geysir, and Gullfoss. This is as touristy as Iceland can get, and by Icelandic standards, it’s not that much. In order to avoid the “crowds”, try to make it there before 10 am, when the tour buses start to arrive, or later in the day. 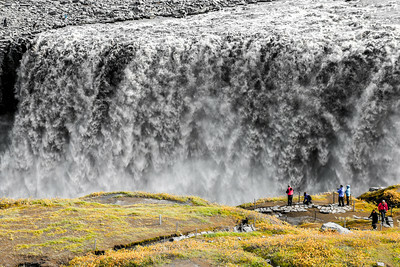 For example, Gullfoss after 6 PM is likely to be empty or close to it. 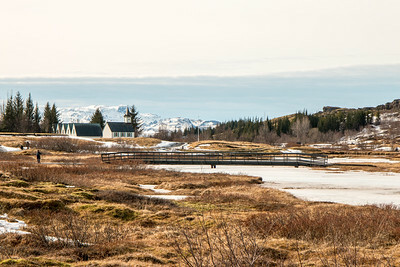 Þingvellir is a National Park and a UNESCO World Heritage site. Its importance comes from the fact that it’s located in a rift valley, where the North American and Eurasian plates drift apart, and also due to being home to the seat of the original Icelandic parliament (Alþingi). If you fancy an adventure, try snorkeling or scuba diving between tectonic plates at Silfra. 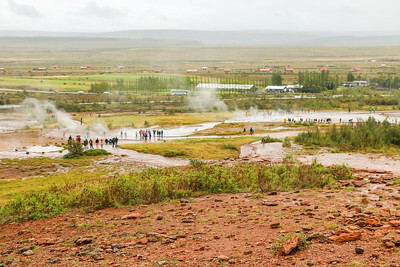 Geysir is the father of all geysers and is located on a very active geothermal area. Eruptions have decreased and if you’re looking for some activity, look for the neighbor geyser Strokkur which erupts every few minutes. Gullfoss is a spectacular waterfall and it really needs to be seen. Try the different viewpoints to get multiple perspectives. It can be reached from the top at different positions and at a lower level as well. Be careful as the lower level one, close to the waterfall, will be frozen in the winter and slippery in the summer, making a lot of water spray. 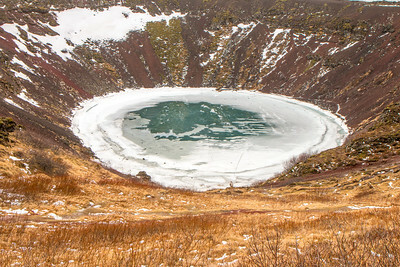 One bonus place to visit is Kerið, a beautiful volcanic crater lake. A track goes around the top of the crater and it’s also possible to go down to the water level. After visiting these 4 places, it is recommended to stay in the area, since the next day the itinerary of the Iceland road trip goes further South. Around road 35 there are many accommodation options available. If you want to relax, pay a visit to the Secret Lagoon hot springs in Flúðir. To head South, get back on road 1. You’ll be passing by a couple of small towns which offer a gas station and supermarket. First stop of the day is at Seljalandsfoss, a magnificent and unique waterfall. What makes Seljalandsfoss unique is the fact that you can go behind it! Yes, there’s even a perfectly marked path and stairs on the left-hand side of it. In order not to ruin your day, be prepared if you really want to go behind it. There’s a lot of water spray and you’ll get drenched without proper waterproof gear. See clothing for more. Most people leave immediately after seeing Seljalandsfoss. Don’t do it. Instead, walk 500 m following the footpath across the small bridge and you’ll reach Gljúfrabúi, also known as the hidden waterfall. This is due to the fact that it’s hidden behind a cliff and inside a canyon, which is pretty amazing, and the best to way experience it is to go inside the canyon. This requires some caution and, again, proper waterproof gear. Going inside it is unbelievable. Back on road 1, a very popular place these days is the Eyjafjallajökull Erupts museum. Here you can watch a short film about the eruption, from the family across the road that experienced it first hand, and the damage that was caused to their farm. The next stop is at Skógafoss, another breathtaking Icelandic waterfall. You’ll definitely feel very tiny when getting close to it. A good way to explore Skógafoss is to take the stairs on the right-hand side that lead all the way up to the top of the waterfall. And, if you have time there’s a hiking path that follows the river upstream with many other smaller waterfalls along the way. 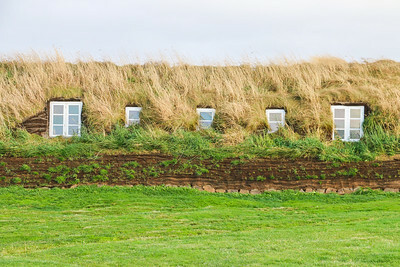 Nearby Skógafoss is Skógar, a tiny settlement where the main attraction is the Folk Museum. This is an open-air museum with a few interesting historical buildings, namely turf houses. 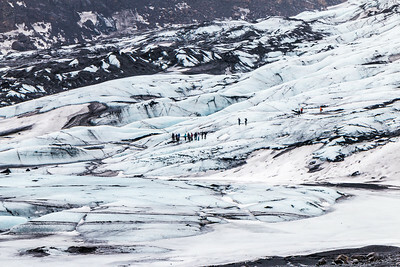 If you want to do glacier hiking, there’s a chance to do it at Sólheimajökull glacier, accessible on road 221. Even if not doing a glacier walk, you can do a short hike to see the glacier up and close. One of the most intriguing places on your Iceland road trip will definitely be the wreck of the Dakota plane at Sólheimasandur. To get there, you need a 4×4 car and to find the correct gate entrance, on the right-hand side of the road 1, just 2 km after passing the turn to road 221. UPDATE: as of 2016 it’s no longer possible to drive all the way to the plane wreck. You must park your car and walk. 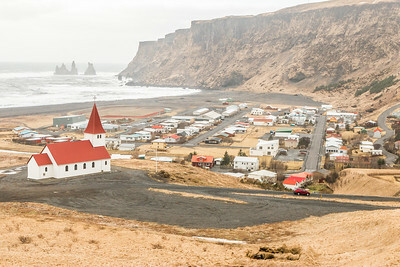 Shortly before reaching Vík, there are two must-visit places, Dyrhólaey and Reynisfjara. Dyrhólaey is a peninsula with interesting cliffs housing many birds, including puffins in the Summer. You can go up to the lighthouse for magnificent views, but mind the road as it’s not suitable for regular cars. 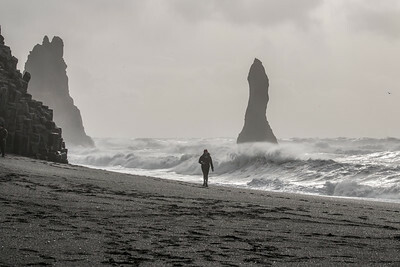 Reynisfjara is a black sand beach with basalt stacks. Very popular and also very dangerous, so don’t ignore the warnings and get too close to the sea. The highlight of Vík is going up to the cemetery for great views of the ocean and cliffs, which include the very photo-friendly church. Don’t forget to stop at the beach as well. Sleep around Vík. Vík also has a gas station, supermarket and a couple of dining options. Every time we’ve been to the area, we’ve stayed at the Guesthouse Steig, a friendly family-run hotel very close to Vík and, especially, Dyrhólaey. This day covers our favorite stretch of road 1. Seriously, the scenery is out of this world! Many opportunities to stop for a photo. 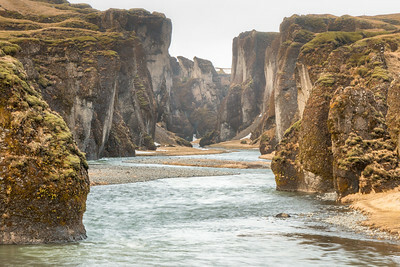 Often overlooked, Fjaðrárgljúfur canyon is one of the most beautiful places you’ll find during your Iceland road trip and is definitely worth a stop. We’ve written all about Fjaðrárgljúfur in the past, including how to get there. The next stop, Skaftafell will keep you busy for at least half-day. 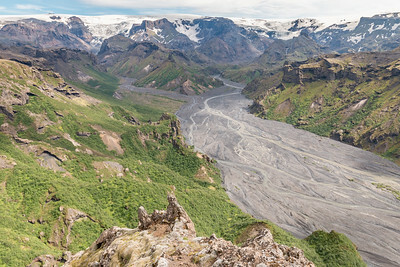 Part of Vatnajökull National Park, there are many things to do here. 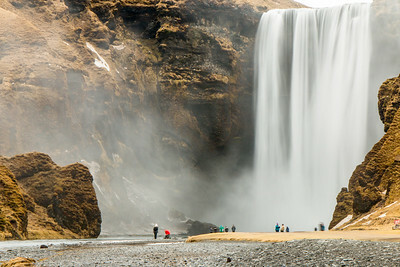 The essentials are hiking to Svartifoss, which takes around two hours return at a comfortable pace, hiking to Skaftafellsjökull glacier, which takes around 1 hour return, and going on a glacier hiking tour, that departs next to the National Park information center. 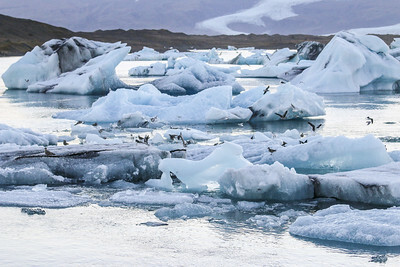 Around mid-afternoon, you should start heading east towards Jökulsárlón glacier lagoon. Shortly before is Fjallsárlón, another amazing glacier lagoon. These places will definitely blow your mind with their beauty. Jökulsárlón is a glacier lagoon that we’ve covered in the past and is a mandatory stop, particularly at sunset. In the winter, ice cave tours depart from here. Be sure to book well in advance! Don’t forget to go across the road to the iceberg beach known as the diamond beach. The day ends here and there are not that many options for accommodation available before Höfn. If you don’t want to drive all the way there, Hali is an option very close by. The East Fjords of Iceland are characterized by a dramatic winding coastline of narrow fjords where tiny fishing villages take harbor. The drive along the coast is one of the most scenic of any Iceland road trip and well worth the detour off road 1. Before heading to the East Fjords, stop first at Stokksnes, just outside Höfn, to admire the beautiful mountain Vestrahorn. There are many opportunities to stop along the way, including at the villages. Some of the most interesting are Djúpivogur, Fáskrúðsfjörður, Neskaupstaður, and Seyðisfjörður. The French heritage at Fáskrúðsfjörður is particularly interesting and so are the road and views to Neskaupstaður. Sleep around Egilsstaðir, the hub of the region for those passing by. 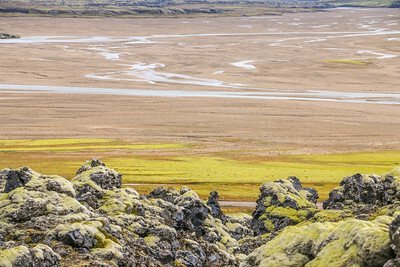 This day takes you through the lunar landscape of the Jökuldalsheiði plateau. Before leaving Egilsstaðir, there’s a possible detour around Lake Lagarfljót in order to hike to Hengifoss waterfall, the third highest in Iceland. The first major stop will be at Dettifoss, Europe’s most powerful waterfall. It can be accessed both from West and East, something we highly recommend doing. Next to Dettifoss is Selfoss, another waterfall. Head north to the Ásbyrgi canyon. With enough time, there are plenty of hiking opportunities in the vicinity. 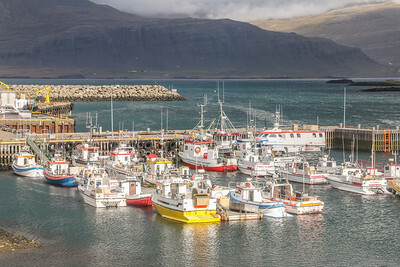 Húsavík, the whale-watching capital of Iceland, is the final stop of the day. Embark on one of the tours for a chance to see some whales! Be ready for the rough sea and the cold. You can sleep in Húsavík or south in Mývatn, which is under an hour away. Mývatn is one of those places where you could spend many days. It will be for sure one of the highlights of your Iceland road trip. The number of things to see and do is quite substantial and we decided to dedicate an entire day to it. On a side note, when we visited, we could see in the distance a red flame in the sky from the Bárðarbunga eruption. Let’s start with the lake. 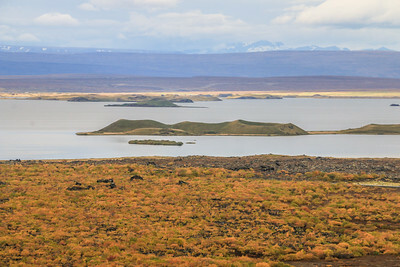 Lake Mývatn is gorgeous and has a very high population of birds, including many and diverse species of ducks. When closer to the water and during the Summer months be aware that there is a higher risk of being bothered by midges. Try not to eat them! There are many possibilities for hiking. A relatively easy one is the Hverfjall volcano. Loose rock makes it a bit tougher to get to the top, but the views are definitely rewarding. You’ll be able to see the lake and the pseudo craters, which require a visit on its own as well. 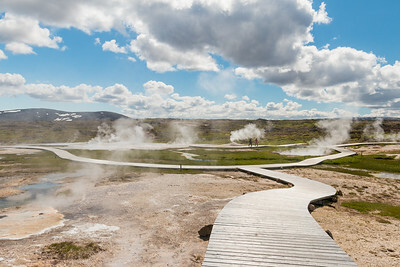 Slightly outside Mývatn is Hverir, a hot spring area with marked walking paths. 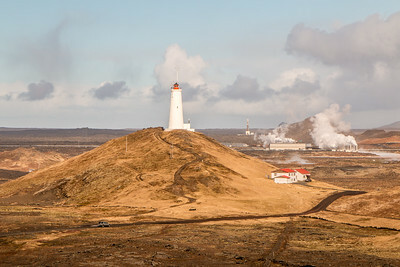 If you head further out past Krafla Power Station, you’ll get to the Krafla volcano area. This includes the beautiful crater lake Víti and the Leirhnjúkur lava fields. Exploring the lava fields on foot is an amazing experience. Allow a couple of hours for this. To relax at the end of a long and active day, go to the Mývatn Nature Baths. If you want to splurge, taking a scenic flight is a great way to experience Mývatn. For this second day in Mývatn, take half-day to explore a bit more of it and then start heading to Akureyri. 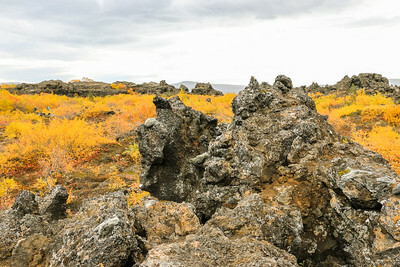 Our main suggestion is to go to Dimmuborgir, another truly spectacular lava field. This one has the weirdest shapes and rock formations, including some caves, plus a nice setting with lots of vegetation. 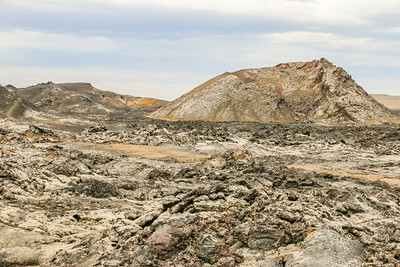 There are clearly marked walking paths throughout the lava field. Don’t forget to stop at the Skútustaðagígar pseudo craters before going back to road 1. Once back on the road, you can’t miss Goðafoss, the waterfall of gods. It sits right next to the road, with plenty of parking and different viewing angles. The road towards Akureyri is also very scenic. Once you reach the second biggest settlement in Iceland you’ll have time to walk around and explore the city center. The main highlights are the church Akureyrarkirkja, which has a good view of the downtown area, and the botanical gardens. To start this day, you face two possible itineraries. The shortest and least interesting one follows road 1 out of Akureyri. 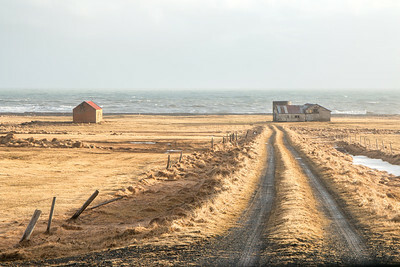 The second and highly recommended one heads North towards Dalvík and the Tröllaskagi peninsula, before joining the road 1. The Tröllaskagi peninsula makes a beautiful drive and includes a couple of tunnels as well. It’s a very mountainous region with plenty of high peaks and stunning nature. 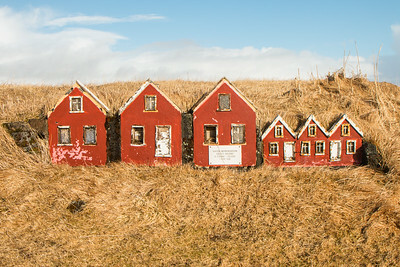 A couple of villages are also worth taking a look, Siglufjörður, and Hofsós. In Hofsós, there’s a very picturesque swimming pool with incredible sea views. You’ll eventually make it to Varmahlíð where you can visit a couple of places of interest nearby. 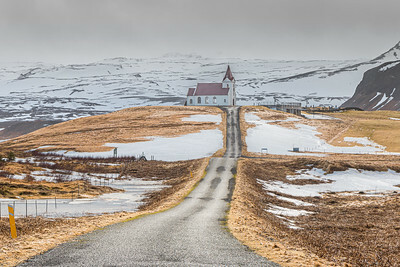 The farm of Glaumbær is famous due to its well-preserved turf houses, and the Víðimýrarkirkja turf church is lovely. Back on road 1, head towards Blönduós. A detour we recommend is the Vatnsnes peninsula, where the Hvítserkur arch is located. The west coast of the peninsula is also very pretty and nature-friendly. Maybe you’ll spot some seals! Sleep around Laugarbakki or Hvammstangi. Head early to the Snæfellsnes peninsula. This region of Iceland is a personal favorite due to the number of amazing things to see in such a small area, particularly the westernmost part of it. Start with by driving to the North of the peninsula. Admire the landscape while on the way to Stykkishólmur and then Grundarfjörður. 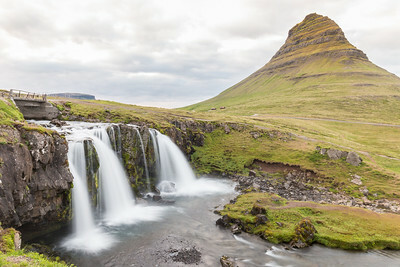 At Stykkishólmur, you can see the Breiðafjörður bay and at Grundarfjörður, Iceland’s most famous and photographed mountain Kirkjufell and the Kirkjufellfoss waterfall. The west of the peninsula is totally worth spending a good amount of time. 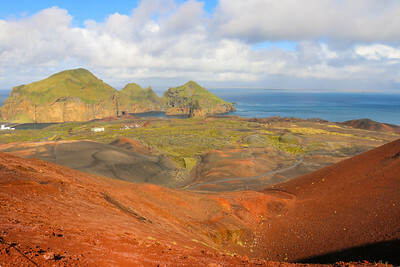 There are lava fields all the way to the ocean and the Snæfellsjökull volcano and glacier in the background. The beaches of Skardsvík and Dritvík are a must. If you like lighthouses, there are a few of them to be seen. 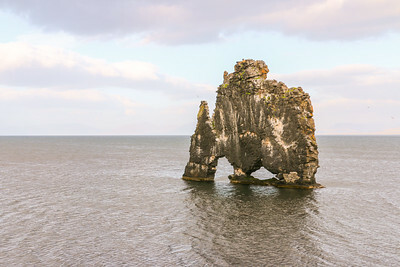 South Snæfellsnes has a couple of mandatory stops at Hellnar and Anarstapi, with plenty to do in the area. 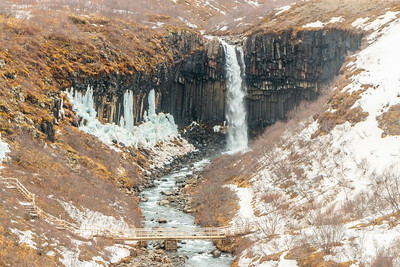 The narrow Rauðfeldar Canyon is also worth a quick visit. Sleep in the peninsula, preferably on the South tip. In the morning, you’ll have time to explore a little bit more of the Snæfellsnes peninsula while heading east. The Gerduberg basalt columns and the Eldborg crater will keep you busy. Head towards Borgarnes and optionally to Bifröst. Here you’ll find a couple of waterfalls and a lava field. The best part of the day will be at Hraunfossar and Barnafoss. 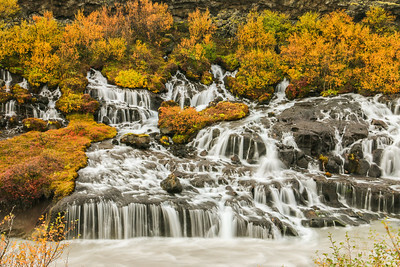 The colors of Hraunfossar are amazing! It’s time to go back towards Reyjkavík. The fastest way is getting back on road 1 and then through the toll tunnel. The best way is around the bay to get a chance to hike to the Glymur waterfall, the tallest in Iceland. For those not visiting during the winter, there’s still a possibility to experience an ice cave, the man-made one at the Langjökull glacier. This is the final day of your Iceland road trip. Time for some last minute shopping in Reykjavík before heading out to explore the Reykjanes peninsula. Worry not, there will be time for some relaxation at the famous Blue Lagoon. Just remember that it is required to book in advance. The highlights of the Reykjanes peninsula are the Krýsuvík geothermal area and the neighbor lakes, the beautiful south coast all the way to the Reykjanes hill lighthouse and bird cliffs, and the bridge between two continents. If you’re feeling adventurous and have the time, you may want to try something unique like going inside Thrihnukagigur, a dormant volcano whose last eruption was 4000 years ago and that is now open for tourists. The tour involves descending 120 m into the depths of the volcano, an expensive yet extraordinary experience. There are other options, some crazier than others. Do you have more days? Great, your Iceland road trip deserves it. Here are a few suggestions. Find out more about Landmannalaugar. The Westman Islands are a small archipelago off the south coast of Iceland. For your Iceland road trip, you can reach Heimaey, the main island, by ferry from Landeyjahöfn in 35 minutes (Summer only) or Þorlákshöfn. Flying there is also possible from Reyjkjavík. Embark on a day trip to the archipelago and discover more about Heimaey and the Westman Islands. The Westfjords are the most remote inhabited region of Iceland. This unexplored part of the country has stunning raw landscapes and beauty, and the perfect addition to your Iceland road trip. 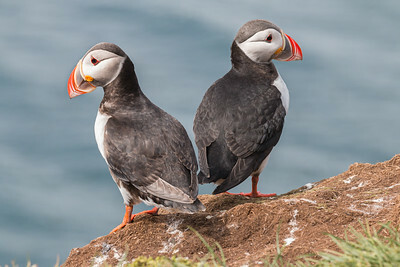 Allow 2 to 3 days to go there and, if you visit during the right time of the year, you can even see some adorable Puffins. To get a glimpse of the Westfjords read our article about it. Þórsmörk is a nature reserve on the edge of the highlands of Iceland, between Tindfjallajökull and Eyjafjallajökull glaciers. It is one of the most beautiful places in the country with spectacular vistas and still not very popular among most travelers. There are plenty of hiking options available ranging from day to multi-day trails. Laugavegur and Fimmvörðuháls, two of the most famous Icelandic trails, pass through Þórsmörk. Getting there is the tricky part because of the rough terrain and multiple river crossings, including the dangerous Krossá river that only experienced drivers with real 4x4s should attempt to cross. 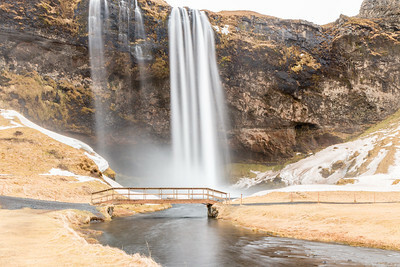 The best alternatives are leaving your own 4×4 before the river and using the seasonal wooden bridges, or the bus from Reykjavík, which stops along the way at Hvolsvöllur and Seljalandsfoss, the two most convenient stops closer to Þórsmörk. Find out more about Thórsmörk. 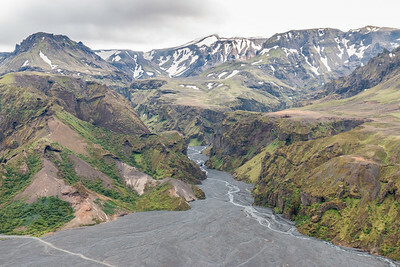 Kjölur is an ancient route in the highlands of Iceland connecting the south and the north of the country alongside two glaciers, Langjökull and Hofsjökull. If you like scenic drives, then this desert plateau is for you. 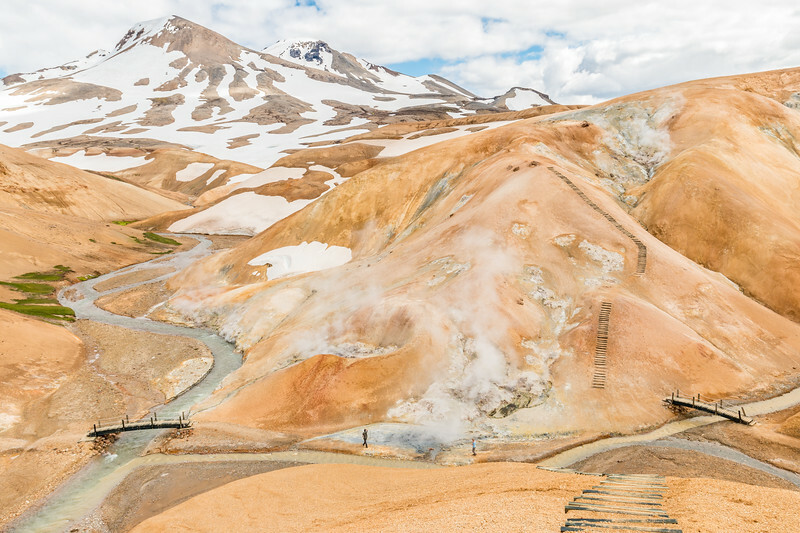 Two mandatory stops along the way are Hveravellir, a set of hot springs and other geothermal features, and Kerlingarfjöll, a beautiful and colorful rhyolite mountain range of volcanic origin. This route is only open in the summer but despite that, it’s one of the easiest Highland roads in Iceland, even suitable for small SUVs. Kjölur is known as road 35. Find out more about the Kjölur route. We’ve mentioned many places throughout this guide and not to make you feel lost, we’ve mapped all of them so you can easily find them. As a travel companion for your Iceland road trip, we highly recommend the map created by International Photographer. Rest assured, driving in Iceland is not difficult. If we exclude Reykjavik and some sections of the ring road, traffic is virtually non-existent and the further afield you go, the calmer it is. So calm that you will encounter sheep on the road. 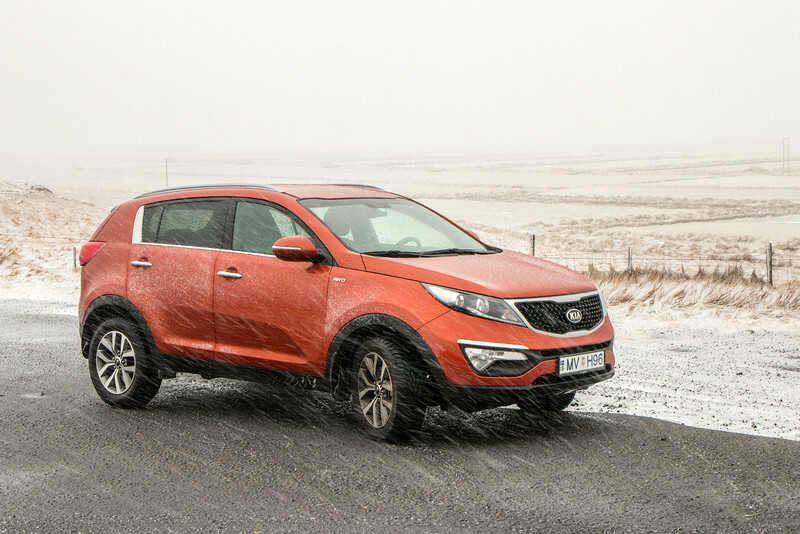 We have a separate and more detailed article with all about driving in Iceland. Worth a read! In short, there are paved and gravel roads. Paved roads are of a very good quality and well signaled, including most of the sights you’ll want to be stopping at, and the speed limit is 90 km/h. Gravel roads are limited to 80 km/h and are generally in good shape, but may be bumpy at times and include potholes. These roads can be further split into another category, mountain roads or tracks, commonly identified with the F prefix. These will include much rougher terrain and potentially rivers to ford. The biggest threat while driving in Iceland is getting distracted by the scenery. Paying attention to the road is important as in most cases there are no side protections on the road. Always drive to the conditions. Look at the weather forecast and road closures. If traveling during the winter months there can be temporary road closures and the mountain roads will definitely be closed. To check for road conditions, visit the official the site of the Icelandic road and coastal administration site at road.is. They provide up to date information about all the road conditions. Check this daily before traveling. Choosing a car needs not to be complicated. If you don’t plan to drive any of the mountain tracks (F roads) then you can stick to a normal 2×2 car as you don’t need a 4×4. If you do, keep in mind that some city grade 4×4 cars are not good enough for the majority of the rougher tracks. One thing to remember: never drive off-road! It’s forbidden and besides damaging the environment you can incur on heavy fines. Gas is available throughout the country, but sometimes the gas stations are far apart. We recommend that you fill your tank once it gets close to half capacity. Most of the rural gas pumps will be automatic and work with debit and credit cards that have a pin code. Without a pin code, it won’t work. We often get asked which car rental company we used for our trips to Iceland. The answer is Blue Car Rental. Good price, quality, and friendly service. You can’t go wrong with these guys. We’ve mentioned the weather and seasons a few times. The best way is to be ready for everything and check the weather forecasts regularly. The best source is the Icelandic MET Office. Packing is always important and even if you’re a seasoned traveler, going on an Iceland road trip requires some preparation. The weather is tricky and there is a common saying that if you’re not happy with the weather, you just need to wait five minutes. The rule of thumb is to dress in layers and have a good wind and waterproof jacket. We’ve written in detail what to pack for a trip to Iceland. Make sure to read it. Accommodation is heavily dependent on the travel style and budget. 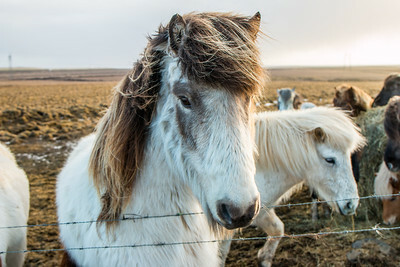 Iceland has a range of hotels, hostels, country hotels, farms, and b&bs. One thing to keep in mind is that accommodation in Iceland is on the expensive side, similar to other higher standard of living countries. When it comes to searching for accommodation, Booking.com is our engine of choice for Iceland with plenty of options available for all styles and budgets. Airbnb is also very popular in Iceland. Due to the increase in tourism in recent years, the offer available is not enough at the peak of the Summer despite a recent boom in construction. It is recommended to book well in advance for July and August. During the Winter, some accommodation will be closed for the season or for same day bookings and will only be available in advance. This applies to the most remote areas. Camping is also widely available and is by far the cheapest option, albeit not very practical during the Winter months. We loved food in Iceland. You’ll find plenty of excellent quality fish and lamb, the traditional meat soup (Kjötsúpa), the super popular Icelandic hot dog, and the delicious yogurt-like Skyr, which we became addicted to. In Reykjávik, you’ll find all kinds of cuisine, whilst around the country, especially in rural areas, the choice becomes more limited. Taste our experience with Icelandic food. Traveling to Iceland is not a cheap affair, with pretty much everything at the highest end of the European price scale. There are more options these days that cater to different types of budgets but still with prices above average if compared to other popular destinations. Need a custom itinerary or additional advice? We can help you plan your trip to Iceland! Find out more about our travel planning services. Ready for your Iceland road trip? Let us know if you have any questions or something to add! Iceland is an amazing and very diverse country. We wanted to showcase that there’s a lot there that often gets overlooked. Wishes from India. I am planning to travel to Europe in April 2016 for maybe 18-20 days. Initially i was hinking of visiting some major 6-7 cities in Europe. 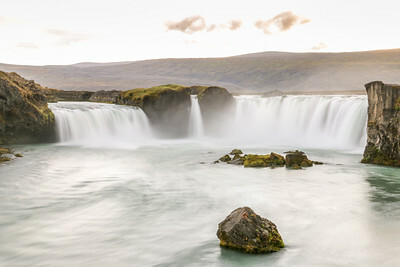 I also had this secret wish to visit Iceland and Norway, as i had been collecting pics of wonderful northern lights and Icelandic waterfalls.While searching in internet about it i found your website. After going through your information i feel like just visiting norway and iceland. I am a person who loves natural landscapes…And iceland and Norway just happen to have lots of them. I am writing this to thank you for the information you have provided. And it would be nice to know more about norway too.. Thank you for your kind words. We’re glad we can inspire people to travel to the destinations we write about and love. If you love natural landscapes, Iceland is the perfect place to go. It’s amazing! Unfortunately, we have yet to visit Norway, but it is definitely on our must-visit list due to the stunning landscapes. Thank you for stopping by. Glad you find this guide useful and our blog inspiring for planning a trip to Iceland. Stay tuned as we have more good stuff about Iceland coming soon! Thank you! Thank you! Thank you! What a helpful article. My wife and I are starting to plan our own trip to Iceland for next June and happened across your site. This is just the kind of trip we were hoping to plan ourselves. You’ve made things much easier for us–and even recommended a good map! Hope you two can make it to Canada someday. Lots to see and do here. Hey! You’re very much welcome. We’re glad it’s useful! June is a good month to visit and you’ll have a blast there. It’s a gorgeous country. The map is really cool because it highlights lots of places with a focus on photography. We have Canada high in our must-do list, but we feel we would need to put aside a considerable amount of time to make a proper visit. We’re looking forward to all of the amazing nature Canada has. I love photography, so the map and ebook will be a great resource. I’m already debating my lens selections. Canada is such a big country, unless you have months to commit to it, you’ll need to come several times. We recently toured Newfoundland for two weeks. Think of it as Iceland-lite. Marvellous landscapes. We live in Calgary, which it only an hour from the Rocky Mountains which is where I grew up. So many great hikes there. Feel free to ask us any questions about Canada if you start planning your trip. Yes, Canada is huge and amazingly beautiful. Probably 3 weeks for a first-timers road trip! We definitely need to think about it. If you’re a keen photographer, Iceland is heaven on earth. Bring your gear and a decent tripod. Lot’s of waterfalls and landscapes to shoot! We are planning to visit Iceland next year, but I didn’t even think about a road trip. This would be the perfect way to explore the country with my kids. Road trip is, in our opinion, the way to go. It allows for a lot of freedom. Your kids would definitely love it! You’re right – it seems like everybody is going to Iceland these days! Tourism has been growing like crazy over the past 5 years or so. 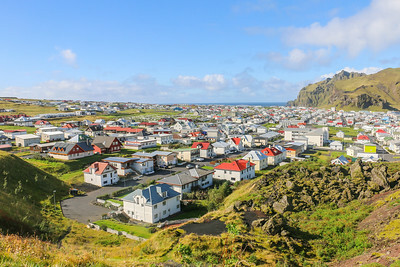 Fortunately, the majority of visitors only visit the area around Reykjavík. Very comprehensive post about a road trip to Island. I am a photographer and Island is on my list of great places to visit. There seem to be so many amazing spots to visit. Since you’re a photographer, Iceland is the place to go! So many photo opportunities all over the country. Skógafoss is on my list. so stunning! It’s one of the many amazing waterfalls in Iceland! Good choice. Iceland is a place I would like to visit. Thank you for the great tips. Especially about the best times to go. Hope you make it there and that our tips are useful! There is no better way to explore Iceland than with a roadtrip, easily one of the most spectacular countries I’ve visited. We’re on the same boat! We’re big on road trips and doing it twice in Iceland ranks really high on our all-time favourite trips. It can definitely go on for months! We’re planning on visiting again next year. Can you believe I’ve been to Iceland six times and have never even gone beyond Jökulsárlón? There’s just so much to see on the southcoast …. one day I’ll head up north, but most likely my next visit will be to the Westfjords first! Definitely can! My second time was 10 days long and also didn’t go past Jökulsárlón (after 2 weeks around the country 6 months before). I’ve seen some of your posts about Iceland over the past months and know you really love the country. I’m a happy member of that club as well! The whole country has so many things that I can’t even choose a favourite region. My plan is to head back next year and do one week in the Westfjords after only having been there a couple of days. This is a really great guide – lots of info. We went to Iceland in winter so we could do the drive. I sort of wish we’d waited til summer, but that just means we should go back! I really loved Reykjavik. There’s your chance to go back! Iceland in the winter is also quite enjoyable (weather permitting). Your Iceland adventures look amazing. Makes me sad because my husband and I were supposed to go Sept 23 (that awesome WOW fare deal) but our houses we are building in Panama were delayed (last minute touches to being complete) so we were unable to go at that time. Your trip was epic, you’ve covered all the details. The best Iceland post i’ve seen. Thank you so much, Melody. What a shame! Well, at least, you can enjoy the warmer temperatures of Panama! Hope you guys make it to Iceland soon, we think you’ll love it. The WOW fare deal has been getting a lot of attention. Lots of new tourists to Iceland thanks to them. 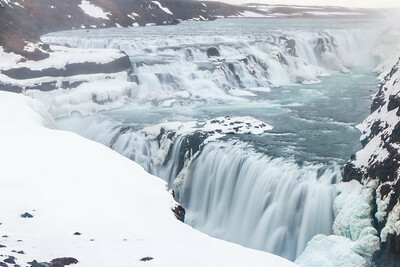 Fantastic info, I am trying to make up my mind whether to go to Iceland for the first half of April this year to celebrate a milestone birthday….can I do pretty much everything you’ve mentioned at that time of year or will some of it be inaccessible? Thanks for reading and enjoying our article! Answering your question. In short, maybe. Bad news first. The highlands (central part of the country) will definitely be closed and access to certain areas may be difficult (like the Westfjords). This being said, the classic ring-road is possible but still very weather dependent at that stage of the year. If you’re lucky, it can work out just fine. A recommendation we always give when travelling before late May or After late September is that the weather can have an impact on your trip. Road closures can happen and you need a plan B, and, in general, takes longer to do the circle around the country. How many days were you thinking about for this? You’re right. Weather can be tricky. March/April still is very much winter in Iceland. Obviously not as bad as other months yet still very unreliable. A couple of days is Reykjavík is enough. Not booking is possible during that time but I would advise you to book at least one or two days in advance to avoid disappointment. Don’t forget to check the weather forecast and road conditions daily. It may be problematic to pass on the east of Iceland if there’s snow on the mountain passes. The highlands are closed until mid/late June and the Westfjords still hard to reach during those months. Enjoy! September is probably safer weather-wise. It all depends on what your plan is and what you’re interests. We definitly want to do some excursions. We thought about of the whale watching tour, the Blue Ice Glacier hike and the pórsmörk Volcano hike. The glacier hike takes about 4 to 5 hours, and the volcano hike 12 hours. I already got information about transport and pick-up locations, but was wondering if a 11 day car-trip is enough if you want to do these excursions? We really don’t want to rush. Do you think it’s a good idea to do one or two excursions with a pick-up from reykjavik to save some time? Thank you for visiting. We’re glad you enjoyed reading our article! You raise a valid point. Without knowing much about your global itinerary, it sounds that at least the glacier hike should be fine within the 11 days road trip (btw, is this in Skaftafell?). The Thórsmörk hike being a full-day affair may change things a bit, but not much! It depends on how your itinerary is looking. One idea is to use the last full-day in Reykjavík to go to the Golden Circle (Thingvellir, Gullfoss, Geysir) and, with this you can save a day. 3 days in Reykjavík is a probably a bit too much. There are lots of day trips from Reykjavík (in fact 90% of them start there). 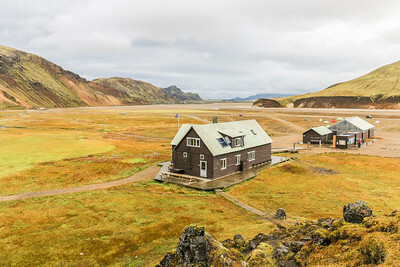 One suggestion is doing one to Landmannalaugar, a beautiful place in the highlands that you can’t get to on a camper. Thanks for your answer. Our departure time in Iceland is at 12:00 P.M, so we stay 3 nights in Reykjavik, but we only have two days before picking up our camper. But maybe that’s too long as well? The whale watching tour, the glacier hike (Sólheimajökull) and kayaking are possible on our trip. But is a 11 day-trip enough, our should we extend our camper booking with one more day…? Did you some excursions on your 12 day trip? And are all above locations on your trip reachable without a 4X4? We were thinking to arrange a pick-up in Reykjavik for the volcano hike, because we have two days before, and two days after our 11 day ring-road trip. If you’re only planning to see the highlights of Reykavík, then 1 day is enough. If you rather also visit some museums, then 2 days is perfect. More than that is not necessary, in my opinion. Is extending a possibility? That would be great. Otherwise, we can work with what you currently have. This 12-day itinerary is 90% similar to what we did, but since I already visited Iceland twice (and going again in June), we made some changes and tweaks to improve it. Yes, we did glacier hiking and whale watching. Those are the two big ones that take half-day. All the locations of the main 12-day itinerary are accessible except the roads between Dettifoss and Ásbyrgi (think they were improving those two roads, at least, the one west of Dettifoss!). The extras have some parts that I wouldn’t recommend on a camper. I think day trips from Reykjavík are a great idea. Especially for those place where you can’t take the camper. Like Thorsmork or, as I suggested previously, Landmannalaugar. Is it possible to do the ring road in reverse (clockwise, heading north first)? Yes, of course. Most people tend to do it anti-clockwise but it’s mostly a matter of preference. Minor adjustments and the itinerary should be fairly similar. After going through your post i feel that we are cutting it very fine on day 6 with lots to do and cover.normally people spend couple of days in myvatn area and akyurei.on the 7th day the journey is more than 400km.Though i have booked my hotels but i can still make changes.Can i leave west fjords completely and spend day 6 and 7 in myvatn area and head back to reykjavik on day 8 or I leave the itinerary as it is and cut on a few attractions on both these days.Would be grateful for your suggestions. We’re glad you found this guide to be useful! And thanks for your kind words. Day 6 is a bit crazy. It’s a very long drive. I would do like you said. Don’t do the Snaefellsnes (Grundarfjörður) and, instead, stay in Myvatn one night and the next one slightly west of Akureyri. A suggestion. On the Golden Circle day, you can sleep further south instead of Reykjavik. Hello Hugo thank you so much for your quick response. Yes I meant Snaefellsnes peninsula which I will skip now as you suggested but if I book near myvatn area then on day 8 i have a straight drive of around 470 km from myvatn to reykjavik where i have to reach by the evening to take the next morning flight back.This will become too taxing especially when you are ending the tour. Basically I have to re organize day 6 and 7 so that on day 8 i dont have to travel more than around 200 kms to reach reykjavik.pl let me knw if you have any suggestions on this. 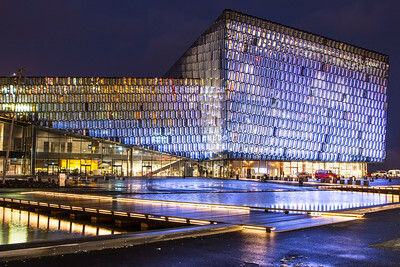 I am returning to reykjavik from golden circle tour just to explore the city and night life in the evening otherwise I will be left with no time in reykjavik. Makes sense. That’s why I suggested one night in Myvatn and the following somewhere west of Akureyri. Something like Hvammstangi. P.S. Hugo and Cristina, thank you so much for the advice you gave me earlier about weather, trip timing, etc. Everything worked almost perfectly! I’m actually kind of glad some things were closed when we were there because there was so much else to do that it would’ve been hard to decide what to miss! Glad to hear you had such a good time and that our tips were useful. Hvammstangi is a great place. I’ve stayed there once and staying there again (at the cottages) in a month. With a bit of luck, you can also see some seals there. 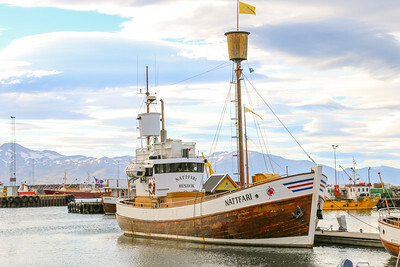 how is the whale watching trip at husavik. what are the chances of sighting? any suggestions on the must do trips or excursions based on my itinerary. Since i have only one day (barely) at myvatn area what should i do and what do i skip ? Husavík is the best place in Iceland for whale watching but it’s nature.. there are no guarantees. They have a pretty high success rate, though. One of the most interesting things you can do is glacier hiking. A good place to do it is at Skaftafell. Drive around the lake and there are plenty of reasons worth stopping for. Don’t miss dettifoss or Krafla (search for these). Hi, thank you for such a detailed itinerary! Serves a great help to us. Just to check with you, as we will be driving a 2WD in winter and would love to follow your itinerary above, is there any places above which are not accessible? In how many days? and when? Don’t forget the days are shorter. In general, if you stick to route 1/ring road, it should be possible to do it but you need to pay attention to the weather and road closures. The eastern part from Egilstadir to Myvatn may be closed. All of the highlands will be closed and this includes all F roads. So, no worries about f roads. 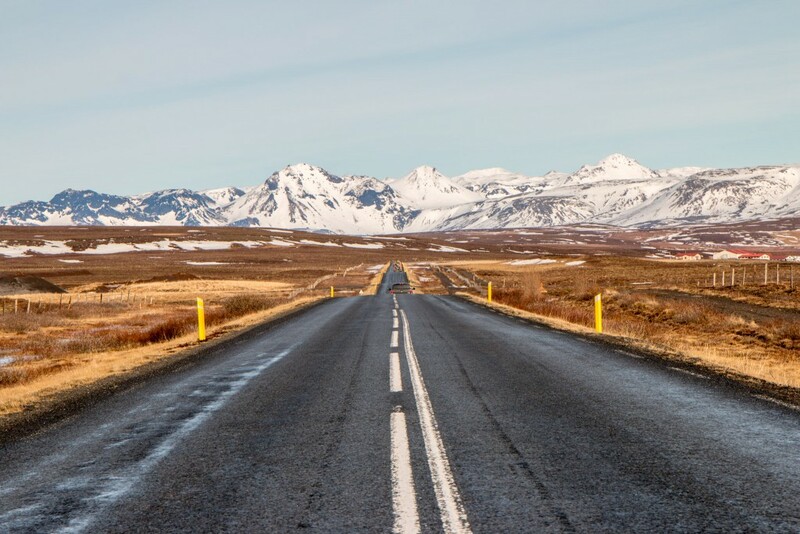 You can find out more about driving in Iceland here: https://breathewithus.com/driving-in-iceland/. It has a lot more detail and it’s meant to complement the road trip guide. Thank you for your prompt response. We will reach on March 20th and intend to be there for 11- 13 days (still deciding on the itinerary). So do you means that i could follow all the itinerary above except for the day 5 – East Fjords? I researched and realized that march will have about 12 hours of daylight so it should be fine isn’t it? No worries about daylight hours in March. In theory, 11-13 days is good enough but road closures can happen, even in March. They should not last long unless the weather is really bad. Don’t rush it and have some spare time in case you need to wait some hours or a day. What a lovely and detailed blog. Looks like the two of you had a fantastic time. Did you have any problems crossing one lane bridges? We know there are many visitors who are not familiar with them (nor the one lane bridges) and gets nervous passing them. This is so helpful as I plan out an itinerary!! If possible, I would love your advice 🙂 I’m planning a trip to Iceland from April 2-18, and have a few questions about accessibility: (1) Is it possible to hike in Skaftafell in early April (not glacial hike).. Just a regular hike on your own without a guide? (2) Do you think it’s possible to venture here: Dalvík and the Tröllaskagi peninsula? (3) Are there any paid tour activities you recommend (glacier hiking, etc…) for that time of year? Thank you!!! 1. It should be possible but it really depends on how much snow. 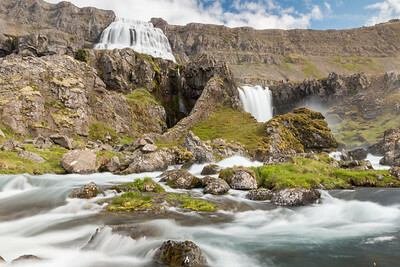 At least the svartifoss hike (2h return) and the glacier face (1h return) should be ok. The visitor center has information about the trails conditions. 2. Yes. It’s possible and recommended. Beautiful part of Iceland. Do take a look at road conditions. Although there are tunnels in the region, it’s best to be prepared. 3. Glacier hiking is always a good idea. Takes around 3h and you can combine it with your trip to Skaftafell. Whale watching? You can do it in north in Husavik. Hi Sabrina, with regards to your question #2, I drove the Tröllaskagi Peninsula around April 9th last year (east to west) and it was definitely accessible. As Hugo said, there are a lot of tunnels, and you should definitely check the road conditions before travelling, but it was absolutely fine for us and well worth it! There was only one slightly scary part when we were driving around the very northern tip of the peninsula (wind and sleet), but it didn’t last long and we survived! We just drove very slowly and carefully. 😉 There was still a lot of snow around and it was quite beautiful in parts. Hardly any traffic on the road. I found it really different and fascinating to the rest of the trip with all the tunnels! You’d pop out into a different world. 🙂 Hope you enjoy Iceland – it is such an amazing country and I am dying to go back. Thank you so much for your help!! I can’t wait to explore your other guides :)! This is probably one of your best posts. EVER! Thanks for these tips – we’re doing an Iceland road trip with our kids this summer so saving this as we want to see as many of these places as possible! We’ve got about 10 days – think we’ll have to leave out the East Fjords and the far west but hopefully we should get to the rest! Iceland seems so magical with all of its breathtaking views and natural attractions. Bookmarked your page for future reference! Keep it up, guys! Thank you so much for the detailed information. I just wanted to know if you are driving in June for about 3 days on the Route 1/Ring Road, is it necessary to have a phone with SIM card or a data plan? You’re welcome! Not necessary. There is wifi pretty much everywhere like gas stations, restaurants, etc. We never felt the need to have 100 internet coverage. Your phone should work normally in case you need to make calls. Oh sorry I meant to say do you think it’s doable to forego phone service in Iceland if travelling for 3 days in June. I’d advise against it. It’s useful to have at least the possibility to make calls. Your network should be able to roam in Iceland. Hi guys 🙂 I’m currently planning our September Ring Road trip and found your guide really helpful, thanks for your awesome work! I have a question regarding day 10 in Snaefellsnes. I can’t find the Ditrivik beach on Google Maps or just googling it also has no real results. As I don’t want to miss a single awesome thing, can you tell me if you made a typo or help me to locate it. Thanks a lot. You’re welcome. It should definitely be ditrivik but I can’t confirm right now since we’re traveling. Shoot us an email and we’ll get back to you in a couple of weeks! Omg thank you for this!!! i was having a hard time finding things to do in some regions and this article totally helped! I feel a lot more prepared for our trip! thanks again!! Without driving, you need to join some tours and there are plenty available. Checkout guidetoiceland, extremeiceland, reykjavikexcursions. At least 10days to go around the country! Thanks for the Fjaðrárgljúfur canyon tip. Look amazing and didn’t have it in my list. I’m going in July! Amazing description ! It is helping me a LOT ! I really thank you !